56 West Regent Street, Glasgow. In 1948 56 West Regent Street was a plumbers store owned by John Richmond & Company. In the 1950s it was opened as "The Nosh Bar." In 1960 it was owned by Mr. A Nobile. The premises was also known as the Colony Restaurant. However it will be best remembered as Burns Howff for its live rock bands, music and sing-a-longs. John Waterson took over the pub in March 1967 and turned it into one of the best known bars in the city. He formerly owned Burns Cottage in Paisley Road. John Waterson in the long bar of the main lounge in Burns Howff. 1967. Glasgow architect Dan Kemp was responsible for the transformation of the new Burns Howff which was formerly the Colony restaurant. The popularity of music in Mr. Waterson's other premises the Burns Cottage was on a television show about a singing competition, see Burns Cottage, the popularity of the event sparked Mr. Waterson to open up in town, which was the first free house in the city for some years. A public lounge bar had been laid out on the lower floor, with spacious seating, in black leather upholstery. Red lights were sunk in the low ceiling, while the bar was simply illuminated, including spot lights on the gantry pointing to the bust of the Bard. Upstairs another long bar had similar seating for about 140 and here Grace Boyle presides on the bar, designed on a smaller scale with the main bar downstairs. Another form of entertainment in one corner holds the five-piece "Ploughman" group which performs daily, except Saturday mornings, when the Jazz Centre offers music. Closed circuit TV had been introduced, if the demand is there, to permit customers in the lower lounge to watch the band performing above. The music is relayed throughout the premises. At the rear of the premises on the lower floor there was also a special cold room which had something new in beer containers. These were three stainless steel containers each holding the equivalent of five barrels. They are thermostatically controlled. A pilot light at one end of the main bar indicates where beer is being drawn at any particular time. In charge of the Main Bar was Margaret MacNeil, while managing the premises was Mr. Tom McGunn. Mr. Waterson, who was carrying on the Burns Cottage and the Market Bar, Paisley, has been in the Trade for some 30 Years. Another photograph of John Waterson with full highland attire. 1960s. 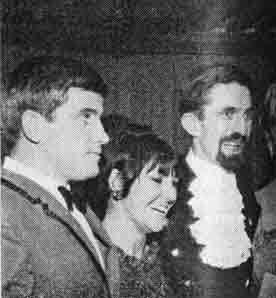 John Waterson with the leaders of the Bards and Sabres. 1966. See Burns Cottage. John Waterson on the right next to Anthony McAulay of the Pig & Whistle and J Donaghey of the Devon Bar. 1970. 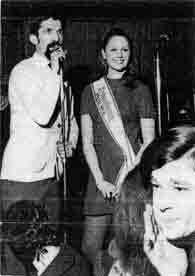 Mr. John Waterson with Miss Kronenbourg, 1970. Miss Kronenbourg, Fiona MacDonald from Glasgow, being introduced by John Waterson at a reception at Burns Howff, West Regent Street, Glasgow to promote the French lager. Miss Kronenbourg had just completed a tour of central Scotland and the Borders accompanied by salesmen from Tennent Caledonian Breweries, agents for the lager in Scotland. 1970. Left to right Mr. J Flynn, president of the Glasgow Vintners; Mrs. Flynn; Mr. George Ramster, secretary of the Glasgow Association; Mrs. J Waterson; Mr. W Martin, Calypso Bar; Mrs. Ramster and John Waterson. 1974. Left to right, Bailie McGrath; John Waterson; Mrs. A Stewart; Mrs. J McCabe; Mrs. J Waterson; Mr. J McCabe; Mrs. McGrath; and A Stewart of Buchanan Booth's. 1973. Burns Howff finally closed in 1984. If I had not seen it with my own eyes, I would not have believed it. Even having seen it, I could hardly credit it. I had heard of queues at bingo halls, dance halls and cinemas, but until last Saturday I had never seen a queue of over 200 people waiting for an hour to get into a pub. Yes, queueing for an hour on Saturday mornings. The place? The Burns Howff., in the centre of Glasgow. I knew the beer there was good - but this was ridiculous! The bar opened at 11a.m. sharp, and by two minutes past every seat in the 200 - odd capacity lounge was occupied. John Waterson - who owns the Howff and a couple of other places, was smiling broadly, which is hardly surprising. "It's been like this for weeks. I could fill the lounge five times over. Last week I turned away about a hundred good customers by half-past eleven - then I stopped counting." he said. The reason. John admits, that the place has become so popular is not the good grog but the group who are on the stage - Beggar's Opera, a poperatic group with a fantastic musical range. They mix pop with high opera and do all their own intricate arrangements. John, one of the men who first started music in pubs, say - "They are the most brilliant musicians I have heard in all my years in this business. They must go to the very top. It is inevitable. "The audience sit almost hypnotised and hardly a soal leaves the lounge until we close at 2.30 p.m." Beggars' Opera, incidentally, will not be on the stage in the Howff to-morrow, just in case you are thinking of joining the queue. John has only one disappointment - he cannot afford to have them in every night in the week. The reason - the boys are making such good money. Says John - "I feel that the magistrates should unbend just a little and allow us to charge an admission fee at the door. This, as far as I can see, is the only way that publicans are going to be able to raise standards of entertainment."